Today Samsung announced mass production of a SoC built on its third-generation 10nm "10LPE" manufacturing node. It was only this January that Samsung announced mass production of its 14LPP process that ended up being used in the Exynos 8890 and the Snapdragon 820 powering up a large amount of flagship devices this year. This time around the announcement comes quite early compared to the past 2 years and I wasn't expecting any news from the foundry till maybe later in the quarter. This does however bode well for the SoCs built on the process as they seem they'll be able to easily make the spring 2017 device release schedule. There wasn't any specification as to what kind of SoC the mass production announcement is refering to, but it's very likely we're talking about S.LSI's next generation Exynos - or maybe even Qualcomm's Snapdragon 820 successor, both of which we'll hopefully hear official announcements from in the coming months. 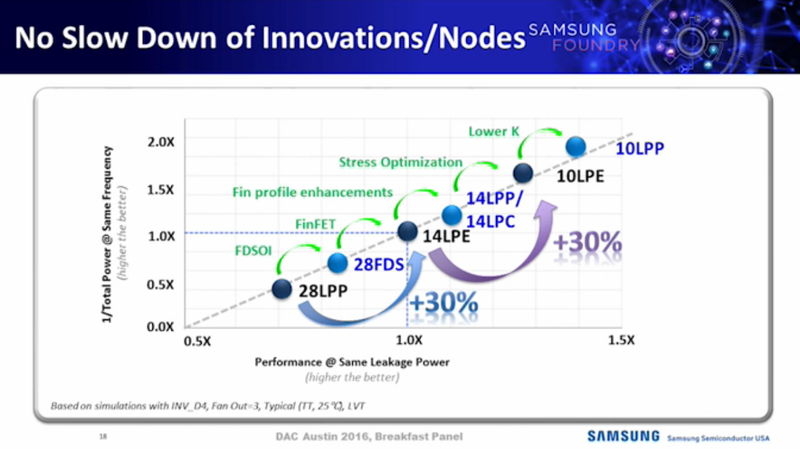 Credit: DAC 2016 Samsung/Synopsys Breakfast - Ready to Design at 10nm! The process promises some significant speed and power efficiency advantages over current generation designs so it's likely the next generation of devices will see a large boost, similarly to how the first 14/16 SoCs had large improvements over previous generation 20/28nm designs. Interestingly the new SoCs will have an edge on recent and upcoming designs still being released on 16nm manufacturing processes, such as Apple's A10 or other TSMC customers who have to wait till next year for 10FF. This presents itself as an opportunity for vendors such as Samsung and Qualcomm to try to close the performance and efficiency gap seen in the current generation through the manufacturing process' good timing. I got you, but my suspicion was bolstered after going through this. 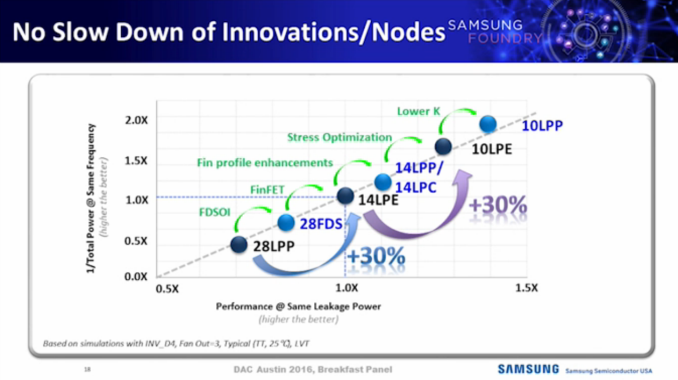 Just FYI, Samsung's and TSMC's timelines for 10nm are pretty much the same. It seems like the A10X will ship on TSMC 10nm, likely Q1 2017, maybe very beginning of Q2. TSMC also has very aggressive plans for 7nm; certainly the plan right now is for risk production early next year, and likely the A11X in Q1 2018. Then the plan of record is a breather for a 7nm+ in 2019 and 5nm shipping in 2020.